On the 17th (Tue), spend a fun day on foot with Walking tours. The adventure continues: explore the historical opulence of Amber Palace, admire the landmark architecture of Sheesh Mahal (Hall of Mirrors), get engrossed in the history at City Palace of Jaipur, and view the masterpieces at Jitesh Arts. For reviews, maps, other places to visit, and more tourist information, read Jaipur tour itinerary planner. Washington DC, USA to Jaipur is an approximately 20.5-hour flight. You can also do a combination of subway, bus, and flight; or do a combination of train, bus, and flight. Due to the time zone difference, you'll lose 10 hours traveling from Washington DC to Jaipur. When traveling from Washington DC in December, plan for warmer days and a bit warmer nights in Jaipur: temperatures range from 78°F by day to 50°F at night. Finish up your sightseeing early on the 17th (Tue) so you can travel to Kanoi. On the 18th (Wed), identify plant and animal life at Wildlife Areas. Keep things going the next day: stop by Desert Art Gallery, admire the striking features of Kothari's Patwaon-Ki-Haveli, and then contemplate the long history of Jaisalmer Fort. To find traveler tips, more things to do, ratings, and tourist information, read Kanoi route planning tool . Use the Route module to find suitable travel options from Jaipur to Kanoi. Finish your sightseeing early on the 19th (Thu) so you can travel to Salawas. 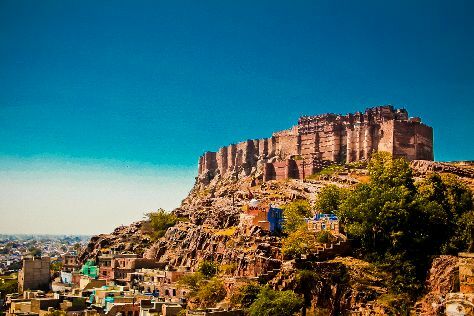 On the 20th (Fri), get outside with Outdoor Activities, then pick up a one of a kind souvenir at Ganesh Handicrafts, and then contemplate the long history of Mehrangarh Fort. On your second day here, pause for some photo ops at Jaswant Thada, make a trip to Ghanta Ghar, then contemplate in the serene atmosphere at Jain Mahavira Temple, then take in the spiritual surroundings of Jambaji Temple, and finally explore the world behind art at Umaid Bhawan Palace Museum. For where to stay, more things to do, and other tourist information, read our Salawas trip maker website . You can drive from Kanoi to Salawas in 5.5 hours. In December, daytime highs in Salawas are 81°F, while nighttime lows are 51°F. Finish your sightseeing early on the 21st (Sat) to allow enough time to travel to Udaipur. Kick off your visit on the 22nd (Sun): get engrossed in the history at City Palace of Udaipur, take in the spiritual surroundings of Jagdish Temple, and then contemplate in the serene atmosphere at Ekling Ji Temple. To find maps, other places to visit, where to stay, and tourist information, refer to the Udaipur trip planner. Drive from Salawas to Udaipur in 4.5 hours. In December, daily temperatures in Udaipur can reach 77°F, while at night they dip to 48°F. Wrap up your sightseeing by early afternoon on the 23rd (Mon) to allow time for travel back home.